Feather belts, what a great feather accessory. I really like these pictures I found of feather belts they are absolutely stunning. And of course you have at the end of the post a link to a great D.I.Y feather belt project. First off is this nice and simple peacock feather belt. 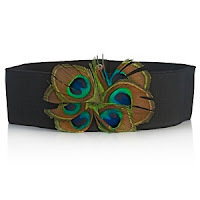 Hot in Hollywood Feather belt, sold on HSN.com for $14.99. It is the perfect way to add a touch of color and fun to a plain black or white outfit. Next we have this Obi Feather Belt. And last is this more complex but I think most exotic feather belt that I found on the blog Emmys Fashion Views. Don’t worry I didn’t forget about the link to the D.I.Y feather belt. 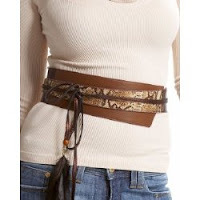 Check out Style Reload "The Feather Belt". It’s a blog by Virginie Peny a French stylist and blogger who is super cool! Let us know what you think and leave us a comment.